The young bass Florian Spiess gathered his first musical experiences in the choir of the Wiltener Sängerknaben, before he was a soprano soloist with the Vienna Boys Choir from 1990-1994. While still at school, he had his first appearances at the Tiroler Landestheater (as Friedrich in The Sound of Music). After graduation, he began his singing studies at the Tyrolean State Conservatory with Prof. Karlheinz Hanser. As part of the training he has participated in numerous productions (including as Sky Masterson in F. Loesser’s Guys and Dolls, as Leporello in Don Giovanni and as Cinderella’s Prince and Wolf in Steven Sondheim’s Into the Woods). Also during this time he had various guest engagements at the Tiroler Landestheater (for example as a Flandrian deputy in Verdi’s Don Carlo). In 2005, Florian Spiess followed Prof. Karlheinz Hanser to the University of Music and Performing Arts in Vienna, where he attended the song class of KS Robert Holl. Florian Spiess graduated with honors and the honorary prize 2011 for the best graduate of the entire university. In 2005 he also received a scholarship from the German-Austrian Richard Wagner Foundation. In 2006, KS Brigitte Fassbaender engaged the young bass as 1st soldier in Richard Strauss Salome at the Tiroler Landestheater. He then sang the Martino at the summer opera Schärding. In 2007, Florian Spiess sang Osmin at the Heidenheim Opera Festival with great success. He was selected by Eva Wagner-Pasquier for participation in the Académie des Festivals de Aix-en-Provence in June 2007. There he could also work with Mark Minkowski. As part of the „Festwochen für Alte Musik“ in Innsbruck, he was engaged as bass soloist for the project „Dresden Surround“ under Konrad Junghänel in 2007 and sang the Caiaphas and the Kriegsknecht at the Brockes Passion under René Jacobs and worked as a member of the ensemble in Telemann’s The Patient Socrates With. In 2008 he sang with great success the role of Bonzo in the Indian premiere of Madame Butterfly under Johannes Wildner in Mumbai, as well as at the „Kammeroper Schloss Rheinsberg“ under the musical direction of Ingo Ingensand the Osmin (Entführung aus dem Serail). After a guest engagement as Silvano in Cavallis La Calisto and Figaro in Le Nozze di Figaro, Florian Spiess was a member of the ensemble of the Linz Landestheater in 2009/10, where he sang roles such as Figaro, Crespel and Hermann in Hoffmann’s Tales and Jupiter in Platée. As part of the „Capital of Culture Linz“ project 2009, he sang in the world premiere of the Philip Glass opera Kepler the bass part. From 2010 to 2012 Florian Spiess has been a permanent member of the Volksoper Wien. There he was u.a. in The Magic Flute as a speaker, in Tosca as Angelotti, in Turandot as Timur and in Rigoletto as Sparafucile. The season 2012/13 Florian Spiess started with a guest engagement at the Volksoper Vienna and continued with an engagement at Volkstheater Rostock. There, the young artist convinced especially as Sarastro in The Magic Flute, as Bartolo in Rossini’s Il Barbiere di Siviglia and as Zaccaria in Verdi’s Nabucco. In the seasons 2013/14 and 2014/15 Florian Spiess was a member of the ensemble of the Hamburg State Opera, where he sang the Sprecher in The Magic Flute, Zuniga in Carmen (premiere cast) and Raymondo in Handel’s Almira (premiere cast), as well as Colline in La Bohème, Biterolf in Tannhäuser and Il Re in Aida. 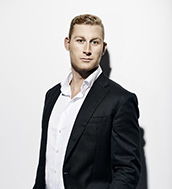 With Almira under Alessandro De Marchi, Florian Spiess returned to the Innsbruck „Festwochen für Alte Musik“ in the summer of 2014. In the season 2015/2016 he debuted u.a. in Rameau’s Les Indes Galantes at the Staatstheater Nürnberg (Bellone / Alvaro). Under the musical direction of Alessandro di Marchi, he once again performed at the Hamburg State Opera in Handel’s MESSIAH. He sang JOHANNES PASSION at the Lübeck Cathedral with the Baroque orchestra Elbipolis Hamburg under the direction of Hartmut Rohmeyer . In the season 2016/2017 he sang with great success the Figaro in „Le nozze di Figaro“ at the Staatsoperette Dresden. At the Staatstheater Kassel he appeared in the 2017/2018 season in two new productions: „The Merry Wives of Windsor“ and „The Rake’s Progress“, as well as a resumption of the „Magic Flute“. At the Staatsoperette Dresden he also sang Figaro again in the „The Marriage of Figaro“. The new season starts for Florian Spiess on September 14, 2018 with the role of Marco in „Mala vita“ by Umberto Giordano at the Theater Gießen. Further, he sings in a very special new production at the Stuttgart Opera: Florian Spiess sings „The Mother“ in „The Seven Deadly Sins“ by Kurt Weill and Bertolt Brecht. It is a coproduction of Staatsoper Stuttgart, Stuttgarter Ballett and Schauspiel Stuttgart.